1) Anything inquired into either exists or doesn't exist. 2) We can know nothing of what does not exist because it is impossible to think about what does not exist. 3) Only things that exist can be thought of. be thought about it actually exists. 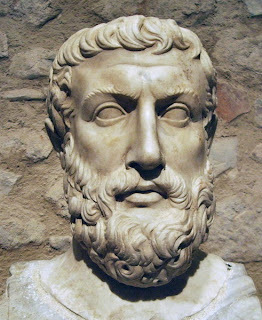 The first thing that must be cleared up is that Parmenides is a monist - he believed that the world is made up on only one type of matter. Modern philosophy tends to like to split things up a bit more and determine between a physical and a mental world and such. Not so for Parmenides. The temptation when faced with the above argument is to attack premise 3 and say "I'm thinking about a unicorn crossed with an echidna and THAT doesn't exist.". This argument only really works when one defines real as meaning something like 'exists in the empirically observable world'. For Parmenides the things that you think about or imagine are just as 'real' as the things that you see and smell so the animal you described is certainly real. We tend to have enormous confidence in calling our everyday experiences 'real' and describing people who experience hallucinations as having an experience that is less real. In some ways we really are being terribly overconfident in making this claim, Nick Bostrom argues that it is, in fact, more likely than not that we are living in a simulated computer experiment. In any case it's not unimaginable that in the future all of our now private mental events may become empircally observable hense breaking down the real/unreal barrier. A) Suppose that something came into existence. B) Then there was a time when it did not exist. C) So we are committed to talking about what (at some time) does not exist. D) But we cannot talk about what does not exist. E) So it makes no sense to talk of something beginning to exist. The same argument works to say that it makes no sense to say that things ever cease to exist.